The Quest for "it"® : Call Me Crazy is a Winner! Call Me Crazy is a Winner! The April 5th Saturday night opening of Amanda Dolan's Call Me Crazy, was not surprisingly a successful one. Bright. Vibrant. Chaotic. Smart. Passionate. Eclectic. Inspired. 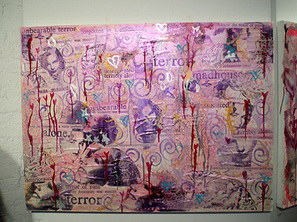 The aforementioned adjectives were all used to describe Call Me Crazy an exhibit that will continue through April 30th. The front room of the Ward Nasse was a fiery storm of large scale works each piece depicting the personality and temperament (seemingly moodiness) of its namesake. The mixed media paintings, said to be a reflection of the artist's own personality-- fifteen works in total, began with a self-titled called Amanda and ended with a called Ophelia. Early to sell was Cyndia Lauper as was another unidentified piece, this Ms. Dolan was happy to share with the evenings attendees as they circled the room with wine in hand. Standouts included Courtney Love, and Frances Farmer ironic as Rock and Roll bad girl named her only daughter Frances after the iconic yet troubled early 20th Century actress. The Courtney piece a pink mass complete with silver spray painted hearts each achingly dripping atop a paper mache like canvas was telling. Images of Ms. Love's many, many moods (mostly glazed over gazes) are filtered in amongst newspaper clippings. Clippings that convey various things one of which reads the word beautiful but done in a very nouveau Barbara Krueger way. This piece rocked! Pardon the pun, if the viewer is not familiar the now legendary Ms. Courtney Love, they are sure to be after this viewing. A lot of emotion, a lot of angst...a LOT of Courtney. Frances Farmer another brutally emotional piece similar in its pink hue, similar in composition, displays images of the attractive mentally ill actress, amidst several heart shaped balloons each with long streaming strings. What is Ms. Farmer thinking as she peers back at her viewer? What is the viewer thinking who is unfamiliar with Ms. Farmer's story? The words alone, deteriorated, madhouse, terror and unbearable fill the piece, all references to Ms. Farmer's many admittances to insane asylums of which was she was deathly afraid of. Again silver spray painted hearts as well as pale blue ones permeate appearing like carefully placed bits of graffiti. In all, Call Me Crazy is a highly motivating display of one woman's understanding of so womens pain. A diatribe of Feminist views presented in an appealing, edgy, over the top way that both delivers and satisfies without being preachy. *photo by The Quest for "it"
© 2006-2017.The Quest for "it"®. All rights reserved.